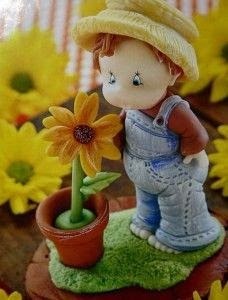 Cold porcelain tinted in a flesh tone, blue for overalls, brown for shirt, reddish-brown for hair, light yellow for hat and bright yellow for flower, green for flower stem, leaves and grass. It works best for me to create body parts separately and then assemble. I would model the body (blue overalls and toes) and let it cure before proceeding. This adds strength to the legs so you don't end up squashing the figure as you proceed. You might also insert part of a toothpick in legs for reinforcment. While waiting for the body to dry/cure, I would work on the head, hair and face. After both the head and body are dry, I would proceed with adding the shirt and arms and attaching head. When dry cold porcelain is attached to other parts, white glue should be used to secure parts. It only sticks well to itself when it's wet on wet. This particular tutorial does not show how to model the head or how to paint the eyes. There's additional tutorials on those topics here at Cold Porcelain Tutorials. Here's a step-by-step tutorial showing how to model a basic head and here's a video showing how to paint eyes if you're unable to locate any eye decals. Also, for additional tips on coloring and tinting your cold porcelain, please refer to this post on coloring.